Portable air compressors are highly useful for avoiding a roadside emergency or being able to quickly pump up sports equipment, air mattresses, and inflatable toys on holidays with the family straight from your car. Most portable air compressors plug into the 12V cigarette lighter socket that most vehicles contain, meaning you will be able to inflate anything from anywhere. Most of them also come with various nozzle adaptors, so it is unlikely that it will be unable to fit what you need it to. Portable air compressors are just like normal air compressors. However, they are designed specifically to be transported and come in a range of sizes that are easy to store in your car either for holidays or for safety. They are powerful enough for car tires but also for smaller inflatables and are perfect take on your trip to use on bicycle tires to avoid the disappointment of being stranded with a flat tire. View the Best Portable Air Compressor for Car, Below. How to use a Portable Car Air Compressor? How to Rewire From Car Plug to wall Plug Small Portable Air Compressor? How long Should a Car Portable Air Compressor Last? With so many portable air compressors on the market, it can be hard to know which is best. Read on for our list of the 10 best portable air compressors and their unique features. 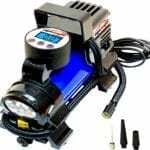 The EPAuto 12v DC Portable Air Compressor Pump is a digital tire inflator that plugs directly into a cigarette lighter socket in your vehicle for convenience. It runs at 12VDC between 10-15 amps and is 120-180Watts. It can be used for a range of tires for different vehicles such as cars, bikes, sedans and midsize SUVs. It is not suitable for LT, HT and truck tires but is not just limited to tire inflation, coming with adaptors for balls and inflatables. The display is easy to read with 4 units: PSI, KPA, BAR, and KG/CM. The portable air compressor comes with a bright LED flashlight torch and has an auto-shutoff feature to prevent over inflation, so you don’t need to worry about knowing when it reaches the desired tire pressure. It also has automatic overheating protection and will stop if overloading occurs. This portable air compressor is diverse, being suitable for a range of tire types as well as inflatables. The Oasser Portable Electric Inflator comes with a large 2200 mAh lithium battery which is rechargeable and can be turned on rapidly. This is convenient as you don’t need to be near a power source to operate it. It is capable of inflating the tires of cars no larger than SUV size, bikes, motorbikes, balls and inflatable toys fast. It comes with a 12V power base, storage bag, 2 air hoses measuring at 13.78 inches and 4.7 inches and has fast coupling and tool gloves. It is highly portable with a sleek design, and the pump comes with a LED light. Its unique pistol shape allows for ease of use and control and is easy to use in both day and night time. The digital pressure gauge has a backlight for convenience, and with the power display, you have the option to pre-set the tire pressure desired to suit your specific requirements. It comes with three values: PSI, BAR and Kg/cm2. This portable electric air compressor is durable with a maximum pressure of 130psi and an excellent performance rating. The pre-setting ability on this air compressor is highly convenient, and its design is ideal for portability. The DBPOWER compact air compressor is a useful tool for any household and is compact, so it is ideal to be stored in the car or garage. This hand-held sized air compressor is highly portable because it is so small but doesn’t sacrifice any power because of it. It is capable of inflating a medium sized car tire from 0-35 PSI in 10 minutes. It comes with a 3metre charging cable which means you can inflate all four car tires of long vehicles without difficulty. It features a 12v lighter plug so you can use it on the road in your car without needing a wall plug and a PSI scale monitor to keep track of the pressure. The flexible air hose is 6 inches and won’t get damaged or tangled with an easy-to-press valve when in operation. It can be used for cars, bikes and sports balls. If you are looking for an air compressor that will easily be stored with limited space, this is the one for you. You can operate the Audew Auto Digital Tire Inflator easily by plugging it into the cigarette socket of your vehicle wherever you are. The cable is 3 meters to enable inflating all four tires with ease, and it works rapidly with automatic inflation. The one-touch switch makes starting and stopping it convenient. The Inflate Right technology allows for automatic shut-off when the right tire pressure is reached. You can re-set the pressure needed before turning it on, and once this is reached, the inflator will turn off automatically. The LED lights are bright and long-lasting for ease of use even at night. The compact design allows for easy to carry with you, so you never need to worry about being caught with flat tires again. It is also ideal for inflating bikes, motorbikes, RV’s, SUV’s, ATV’s, and trucks as well as cars and sports equipment. There are adaptors included for use with inflatables. This portable air compressor is easy to use and will switch off when the ideal pressure is reached with a clear, digital display. The Helteko Portable Air Compressor is extremely durable, made with ABS plastic and stainless steel. The auto-shutoff technology is a useful feature which will mean the inflator will stop when the tire has reached the desired pressure. The LCD digital display is large and allows for precision which will make it easy to use and calculate the desired values. These include. PSI, BAR, KPA and KG/CM2. The multi-purpose air compressor is capable of inflating a mid-sized car tire in 3-5 minutes, making it one of the fastest on the list. The cable is also one of the longest, at 3.5 meters, making it even easier to inflate all 4 tires of longer vehicles. If speed is your priority, then this air compressor is ideal, being able to inflate a car tire in 5 minutes or less. The Tcisa 12V DC Portable Air Compressor Pump also has a pre-set option which will turn off when the desired pressure level is reached which prevents over inflation. Its powerful 140-watt metal motor is durable and can inflate a tired using 30 PSI in 2-3 minutes. You can easily plug into the cigarette lighter in any car to be used anywhere. The large LCD display is easy to read with high resolution. The bright LED flashlight means you can easily operate in darkness when needed in an emergency and can inflate tires of all vehicles such as cars, bikes, sedans, SUV, and motorbikes. There are 3 different adaptors for inflating sports equipment, balloons, and inflatable toys and is equipped with 4 display units: PSI, KPA, BAR and KG/CM2. It comes in a convenient travel bag to make it easy to carry. This portable air compressor has a large light which is ideal if you will be needing it in darker lights and works at a high speed. The Kensun AC/DC Swift Compressor is made by a high-quality manufacturer and is unique in design because of its ability to plug into both home wall sockets and car cigarette lighter sockets in your vehicle making it possible to use everywhere. It comes with a selection of nozzle attachments that will fit almost every inflatable item such as heavy-duty tires, bikes, motorbikes, sports equipment, and inflatable toys and is perfect to be used inside or outside. The advanced functions include an analog pressure gauge, a range of pressure selections and a continuous working time of 30 minutes a 35 PSI. The black woven hose is durable and measures at 80cm. This portable air compressor is ideal if you will be using it at home as often as when you are away because it works with a wall socket which makes inflating smaller items convenient. The Vlair 00088 88P Portable air compressor is made from durable materials and is powered by alligator clamps that attach right onto the battery. The 12 volt – 120 PSI max working pressure can be used when the engine is running. It is suitable for small ATV’s, trucks and sedans with up to 33’’ tires. It features a LED power indicator for convenient use and a long 10ft power cord making it suit long vehicles with this long reach. The air hose is 16ft making inflating tires even easier. The pressure gauge is placed on top of the unit to keep track of pressure easily. While this portable air compressor is good for larger vehicles, it does not work with bicycles. This portable air compressor is extremely powerful and uniquely attaches to your car battery for inflating large tires. This electric auto pump by Fortem is ideal for on-the-go convenience. It plugs into a cigarette socket in any vehicle and is operated by the flick of a switch. Once the PSI has reached the desired pressure, it will stop automatically to avoid over inflation. It is heavy duty and robust with a reliable digital tire inflator that comes with several adaptor attachments to fit a range of different vehicles such as cars, motorbikes, bicycles, ATV’s, Jeeps, sports equipment, air mattresses, and inflatable toys. It is fast and simple to operate with a built-in LED light making it a vital product to keep in your car for roadside emergencies, making less hassle for you even at night. Storing and transporting this air compressor is convenient with the carry bag it comes with. The body is made from durable yet lightweight plastic, and the hose is built to withstand pressure ensuring you will get long-lasting use out of it without it weighing you down. The hose length is 50cm, and the cord length is 300cm for easy to reach inflation. You can be sure this air compressor is sturdy and durable with a strong hose and long cord length. The Breezz Air Compressor is powerful and fast with the ability to inflate a tire from 0-35PSI in less than 4 minutes, making tire inflation in an emergency fast and easy. The body is made with ABS plastic and stainless steel to make it durable and long lasting. It features the ability to present the desired pressure, so you don’t need to worry about over inflation, and will automatically turn off once this has been done which means you can’t over inflate. The bright display is easy to read allowing you to use it with precision to calculate the right pressure needed. The bright LED lights will make tire inflation convenient in the day or night making it less stressful on the roadside. The power cord is 10ft which means you can easily reach all your tires and aren’t restricted when inflating other objects such as air mattresses, motorbike, bicycle, ATV, sports equipment and vehicles up to a mid-sized sedan. The air compressor is hand-sized, making it one of the smallest on the list which is perfect if you have limited space and can keep it in your vehicle or bag unnoticed. This air compressor is both small and durable which is great for active lifestyles and can be carried around easily. Some portable air compressors have an analog screen, and some have a digital one. Usually, the modern air compressors have an LCD digital display which is much easier to see, especially in the dark. The analog displays aren’t always as accurate and can be more difficult to read. While most of the portable air compressors on this list do have a pre-setting option and an auto-stop feature, some don’t. These features will make your experience much easier and will enable you to avoid having to judge for yourself when your tires have reached the optimum pressure level. The auto-stop feature will ensure your tires reach the best pressure without the risk of under or over inflation which could risk causing damage to your vehicle. Again, this is another feature that is common in most modern portable air compressors. It is worth checking this as the light is highly useful during roadside emergencies that might occur at night. This light could work both to help you inflate your tires, but also to keep you safe by alerting others to your presence. If you choose a portable air compressor that comes with a selection of attachments, it will be more likely to fit a wider range of products. This will make your air compressor more useful in the long term as you won’t be limited to just inflating tires but also air mattresses, sports equipment and inflatable toys making it ideal for taking on holidays. Using a portable car air compressor is simple, although they do vary slightly, and it is worth checking the instructions. Once you have connected the plug in the cigarette lighter socket, it will be ready to use. If you have pre-settings on your air compressor, you can use the display to determine the correct pressure before you put the nozzle into the valve of the tire and secure it with a chuck. Once this is done, you can begin to let the air into the tire. Keep an eye on the pressure gauge attached to the air compressor to make sure the pressure doesn’t exceed the desired levels even if it is fitted with an auto-stop feature. The easiest way to use a car plug in a wall plug is to invest in an adaptor which will safely allow you to use the wall plug while still keeping the car plug attached. This will depend on how much it is used and how well it is looked after. Often it is worth checking if the air compressor has a warranty as this will ensure it can be replaced if anything goes wrong. Even if your portable air compressor has an auto-stop feature, it is still worth keeping an eye on the pressure levels, especially if you are reaching the maximum level PSI your air compressor can reach. 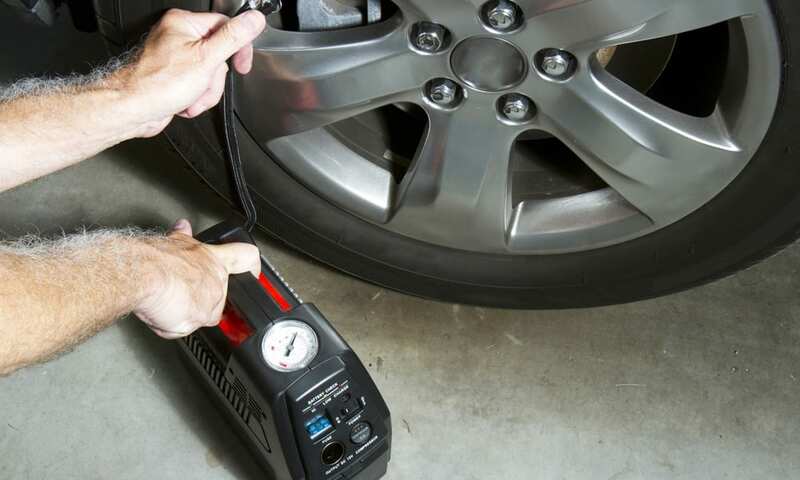 When using a portable air compressor to inflate your tires, you will need a tire chuck to connect between the tire valve and the nozzle of the air hose. While most modern air compressors should come with everything you need, it is worth checking. We hope you enjoyed our article on "10 Best Portable Air Compressors for Cars in 2019", if so, please share and rate it.